With a touch of elegance and sophistication, this slouch style hat is one you’ll adore making again and again. 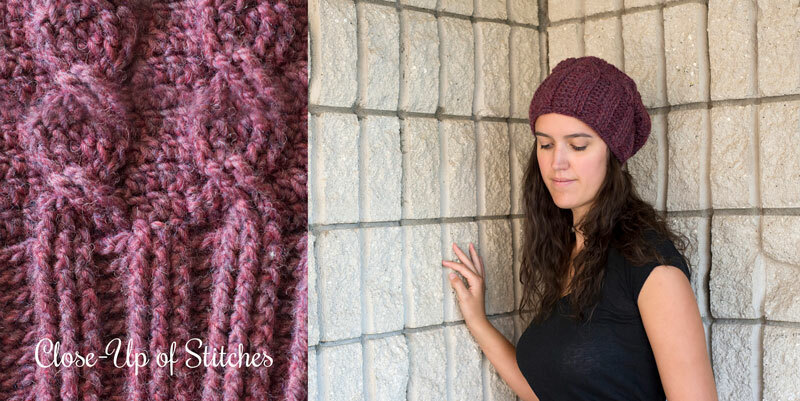 The gorgeous cables make a striking visual element to pair with a comfy, stylish hat. This free crochet slouchy hat pattern features bulky (5) weight yarn and size 6.0mm (J) crochet hook. Pattern features all sizes Child, Teen/Small Adult, and Adult. Cable Sequence: Skip the next 4 sts, FPTR around the 5th stitch, FPTR around the 6th stitch, DC into the 3rd and 4th sts respectively behind the FPTR sts you just made, then FPTR around the 1st stitch, FPTR around the 2nd stitch. Place a stitch marker and move it up with each round. and yarn needle to close whatever gap may still be in the top. Weave in all ends.